“Wild horses.” What image does that bring to you? Close your eyes. What do you see—wild horses, running free, manes and tails flowing in the wind, running across the prairie, leaping over creeks, running up hills…Feel yourself running with them. You can see for miles. Feel the wind blowing your hair. Listen to your heart’s song. What is the dream your heart is singing? Our hearts long for this freedom for all our brothers and sisters. We long for the home where our hearts live. 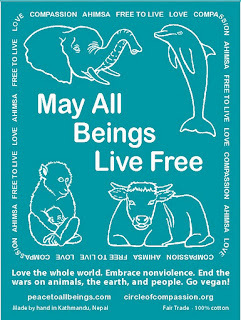 That home is an eternal reality where there is no exploitation, where all the animals, all beings, are free. This world that we live in now is distorted and perverted by the fears of human beings. It is an appearance that will fall away if enough of us persist in knowing and seeing the only infinite and real way of living—which is to live together in a constant state of wonder, intimacy, gratitude, love, and communion with all of life. We all have been given the gift of knowing this home where, not just a few of us, but all people, have reverence for life. The old human supremacy world-view that all life is here for humans to exploit and dominate is unthinkable here. Instead we find a new paradigm of compassion and communion with all life. We do not dream this dream alone. Our dream seems so far away, and some people laugh and call us idealists, but always remember, we do not dream this dream alone. The animals dream with us--all the wild horses, all the animal prisoners in labs, the animals suffering in factory farms, so-called "humane" farms, and slaughterhouses; animals caged and killed for their beautiful fur; the wild animals being trapped, poisoned, and shot; the sea creatures caught and dying in nets; the great whales being harpooned--all our relations dream with us. And the Great Spirit of Life, the Spirit of Compassion dreams with us as well. We all are dreaming together for this freedom, seeing together the Spirit of Love made visible. We do not dream this dream alone. We may be on the fringe of today's culture, but we are at home in the heart of Spirit. We and the animals are the vision keepers for Mother Earth. We live and breathe with the animals and the earth. Our spirits run with the wild horses always toward home, toward the peaceable kingdom, holding the dream. Whatever we do, no matter how discouraged we may get, no matter how hopeless our work may seem at times, let us hold the vision of the wild horses running free. 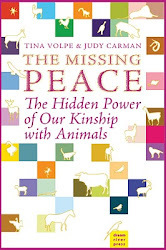 Let us hold the vision of the peaceable kingdom for all life here on planet earth. Thank you for doing your part to dream the great dream with the animals and the Great Spirit of Life. You are on the front lines powering this grand paradigm shift into reverence for all life that is rising like a brilliant new sun. You are helping to change the world-view of human supremacy to one of communion with all life, as it was always meant to be. And so it is. Blessings to you and to all the animals. I wish you strength and divine endurance for the journey. And always remember, you do not dream this dream alone.